Larry J. Sabato's Crystal Ball » Rand Paul: Barry Goldwater 2.0? The Arizona senator broke one consensus. Could the Kentucky senator break another? 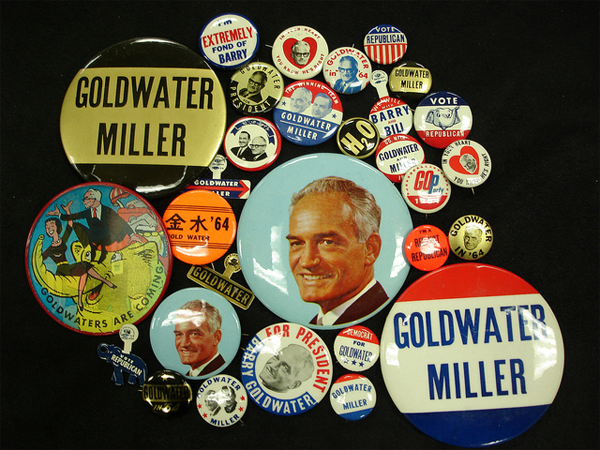 Buttons from Barry Goldwater's 1964 presidential campaign. Photo from the Special Collections at Wofford College accessed via Flickr. Sen. John McCain (R-AZ) was asked recently what he would do in the event of a 2016 presidential contest between former Secretary of State Hillary Clinton (D) and Sen. Rand Paul (R-KY). “It’s gonna be a tough choice,” he said with a laugh. McCain’s ambivalence about a potential Clinton-Paul choice is primarily because of foreign policy: McCain is largely a hawk and Paul is largely a dove, to put it simply. In a Clinton-Paul contest, McCain and many other Washington neoconservatives would be ideologically closer to Clinton than Paul, at least on foreign policy. That doesn’t mean that McCain and others would actively support Clinton, but it does mean that Paul, a likely contender for the Republican presidential nomination in 2016, would have to cut through the establishment to win the nomination. If he got it, the response from many Republicans would be tepid. A Paul ascendancy would inevitably be compared to the rise of Barry Goldwater, who outmaneuvered a series of mainstream Republicans to capture the 1964 Republican presidential nomination. Paul wouldn’t want to replicate the shellacking Goldwater got in the general election, but he probably would try to change the course of the GOP, just like Goldwater. Despite its demolition at the hands of Lyndon Johnson in 1964, the Goldwater campaign is fondly remembered by many Republicans for re-setting the party’s ideological compass. For three decades prior, Republicans argue, the GOP embraced “me-tooism,” simply providing the electorate with a lite version of the Democratic Party. Many conservatives wanted A Choice, Not an Echo, to borrow the title of the famous book by conservative activist Phyllis Schlafly. Goldwater provided it. The mid-1960s were an era, keep in mind, where Democrats had held the White House for 24 of 32 years, and the only Republican president in that time period — Dwight Eisenhower — was hardly a movement conservative. It’s no wonder that Goldwater biographer Robert Alan Goldberg called the 1964 GOP convention the “Woodstock of the right.” Goldwater’s nomination was a defining moment for outsiders in an insider party. A widespread belief in the left-center American consensus “was one of the most dramatic failures of collective discernment in the history of American journalism,” according to Rick Perlstein. The left-leaning historian astutely recounts the Goldwater campaign in his wonderful book, Before the Storm: Barry Goldwater and the Unmaking of the American Consensus. Even as the chattering classes proclaimed an era of consensus, Perlstein documents, a proto-Tea Party was emerging across the country. Those conservatives found a champion in Goldwater and, 16 years later, a prominent Goldwater backer, Ronald Reagan, won the White House. One of the modern-day Tea Party champions is Rand Paul, and he certainly takes after Goldwater on domestic policy in advocating for a smaller, less obtrusive federal government. But where they differ is on matters of war and peace. One of Goldwater’s political problems in the 1964 race was a pervasive fear among many that he would start a nuclear war if elected; the Johnson campaign tapped into this fear in its famous “Daisy” ad. An over-the-top ad used against Paul wouldn’t have an exploding nuclear bomb; rather, it could show a bomb detonated by a terrorist who a declawed national security state failed to catch. Goldwater — even in defeat — shattered the myth of the American consensus. Decades later, history may show Paul helped to unravel another consensus.. Since World War II, the United States has asserted itself as the “indispensable nation,” and while foreign policy has not been bipartisan — far from it, despite the tired cliché that “politics stops at the water’s edge” — both parties have largely reached a consensus on what historian Andrew Bacevich calls the “Washington Rules,” which he described in a book of the same name. American military policy features the following “sacred trinity” of ideas: “An abiding conviction that the minimum essentials of international peace and order require the United States to maintain a global military presence, to configure its forces for global power projection, and to counter existing or anticipated threats by relying on a policy of global interventionism.” Essentially, the United States has a massive military, deploys it around the world, and aggressively uses it to deter others. While President Obama is different than President Bush, it’s hard to argue that either man’s foreign policy in practice really deviated from this Bacevich “trinity,” particularly when one looks at how Obama has massively expanded the use of drones to target terrorists. Would Paul offer something different in a presidential campaign? Republicans have been known for decades as the more hawkish of the two parties, but that wasn’t always the case. The GOP, after World War I, led the charge against internationalist President Wilson’s plan to enter the United States into the League of Nations. Sen. Robert A. Taft (R-OH) was a staunch isolationist, although he narrowly lost the Republican presidential nomination in 1940 to an internationalist, Wendell Willkie. (Taft lost later nomination battles to Dewey in 1948 and Eisenhower in 1952.) Still, there is an “America First” current in American politics that quietly lives on today — anyone who followed the presidential campaign of Rand Paul’s father in 2008 and 2012 could see it. Could a minority position in the Republican Party become a majority one? The John McCains of the world will fight hard to prevent it from happening, but there’s nothing saying that the party of small government at home couldn’t also be the dovish party on defense.